Sweetie, darling, does mummy’s script need surgery? A friend of mine who is always in the know sent me this picture of the new American Patsy and Eddie. While I’m grateful for the first look, I’m also a little scared. OK, so you can’t judge a book by its cover, and all that, but please, please, please tell me it’s not going to look like a couple of women dressed up as Patsy and Eddie at a Halloween party! I don’t even know why this is being taken on now. It was so right the first time around. My greatest fear is that this new series will either be so similar that it looks like a poor reproduction, or so different it will be pointless. Variety has announced that the American version of Absolutely Fabulous has cast its Eddie and Patsy. I recognize Hahn, but I don’t know from where. I remember liking her, though. (Unless I’m thinking of Ana Gasteyer.) And I think Johnston could be a passable Patsy-esque character. But this show still worries me. There is little in this world that delights me as much as watching the original three seasons, but it’s a classic. I love it now because I loved it then. I think AbFab’s time has come and gone. Even Jennifer Saunders should not keep it going in its original incarnation. Whatever gets produced here will have to be unrecognizably different from the original, and then what’s the point of doing it in the first place? 1. 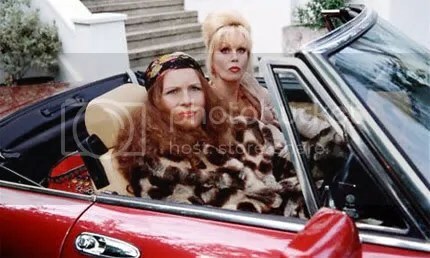 Jennifer Saunders and Joanna Lumley are not playing the lead roles (though I don’t trust them not to make a cameo at some point). 2. Jennifer Saunders is staying on as a producer. I don’t know how involved she’ll be in writing, but maybe some of her wit and charm will rub off.